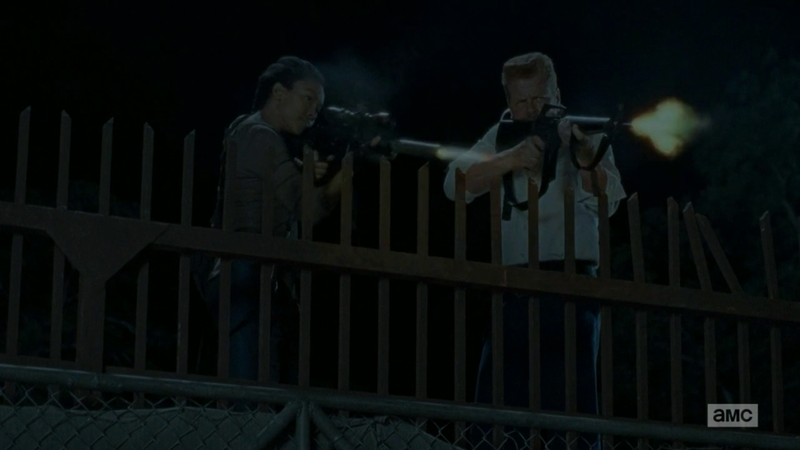 I hadn’t forgotten about the rocket launcher, but I figured if Daryl, Abraham and Sasha were so willing to lay down every weapon they had, and then show one of their guests everything else, they would have surrendered that too. I’m sorry to lose faith. So what happened right after Team Rick and the Alexandrians crept out onto the zombie-infested streets and Sam started going “Mom”? 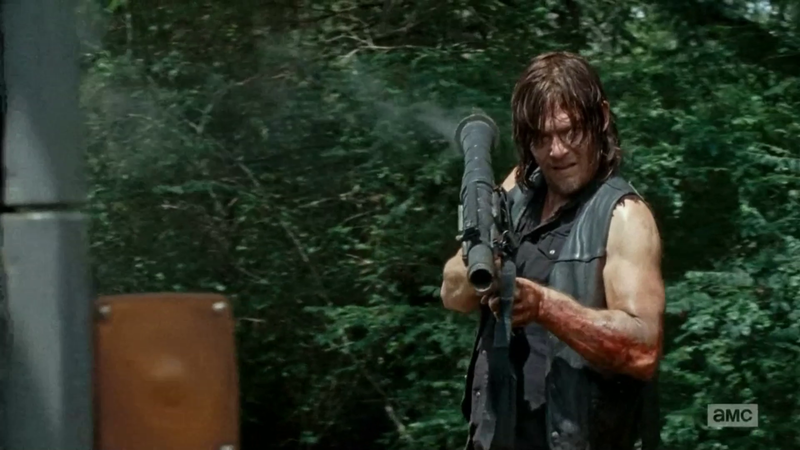 …We still don’t know, because unlike the Daryl scene, this one cut back in a few minutes later. I’m guessing it went all right because everyone was still there, at least for the time being. However, it didn’t take long for things to actually go south, and in most cases, it was for perfectly avoidable reasons. You know what it’s time for? Grab your buzzers and your scorecard, because it’s time to plaaaay…. WHO’S THE STUPIDEST PERSON IN ALEXANDRIA??? Mr. Wolf really wants to escape the makeshift prison Morgan’s been keeping him in. Unfortunately, he decides to make his move during a time period in which the entire neighborhood is swarming with man-eaters, meaning he was actually better off in that basement. As he’s doing this, he brings along Fake Doctor at gunpoint, as if taking a hostage was going to make one whit of a difference given the scenario they were in. Did he think they were going to chase after him? In most cases yes. In this case, no. Mr. Wolf and Fake Doctor got as far as a concealing brick wall, and I still don’t understand how. They’re stuck there until nightfall, and in the meantime, Wolf gives Fake Doctor this creepy speech about how it’s just them now and that she’ll grow to like him. All the while Fake Doctor is biting her lip and shaking her head like she’s about to poop. 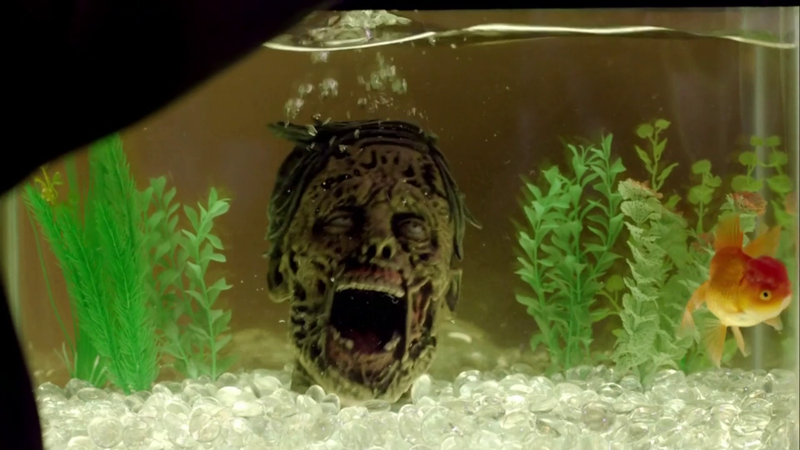 I think she actually was pooping…and the way she kept this face up for over three minutes of screentime, this had to be the longest poop in Walking Dead history. Why didn’t her poop disturb him any? Maybe he’s used to pooping in the woods. It’s left a mystery if Mr. Wolf reforms through this experience or not. He saves Fake Doctor’s life, but it might’ve been just because he needed her to get them to the medical room and save his. 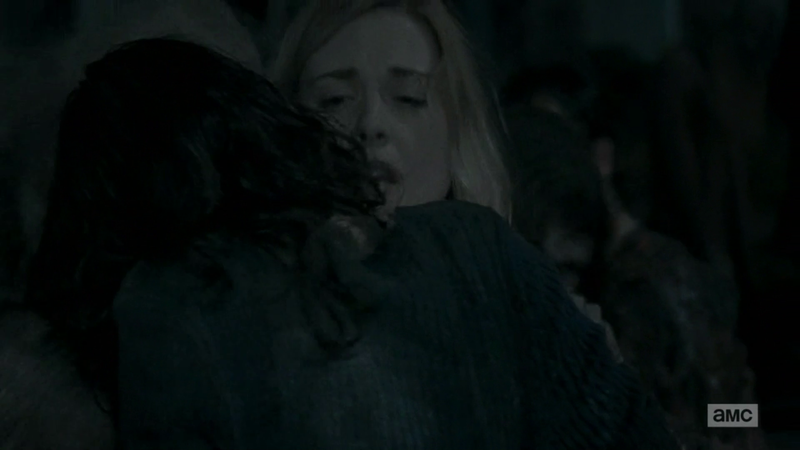 At any rate, he winds up where he was inevitably bound to — in the middle of a large crowd of Walkers, flailing around like an idiot. Mr. Wolf was pretty dumb, but no one would argue that Sam isn’t dumber. 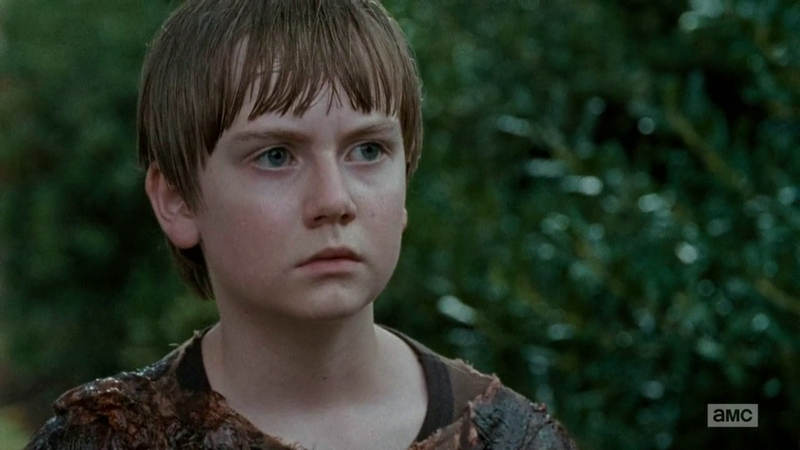 Since he’s so young, you could put forth the theory that it’s actually his mother who’s the stupid one for insulating him from the real world so badly that he got an F-minus out there…..but no, I think if Sam made it to adulthood he wouldn’t have been much different. At one point the gang has to split into two teams, and for Sam’s sake they aren’t sure it’s a good idea. Sam looks his mother in the eyes and with a half-convincing steely-eyed gaze tells her, “I can DO this.” He changes his mind halfway through the journey and starts cracking up. 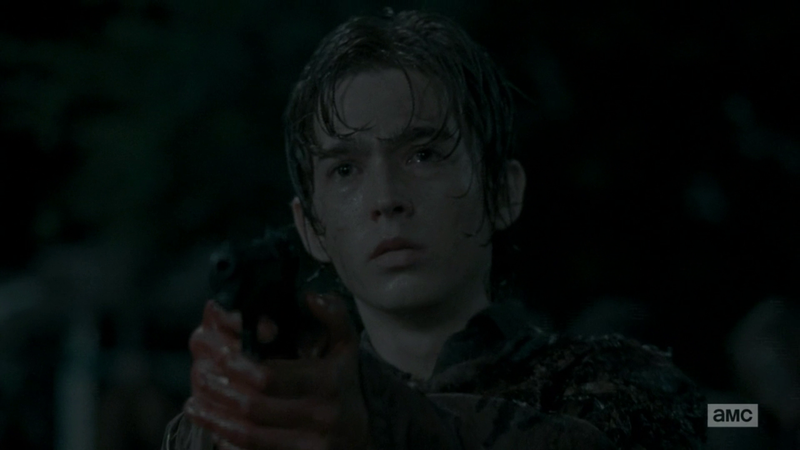 At this point, the only thing that could have saved Sam would have been the AMC censors unwilling to show zombies eating up a child. Maybe they don’t normally approve, but for Sam they understandably made an exception. Ron is even stupider than Sam. If you disagree, let me just point THIS out: Sam succumbed to the herd for reasons of insecurity and unpreparedness. Ron knew fully what to do and how to get out of this, and chose not to, and he chose not to for the pettiest, shallowest reasons possible. We get some weird ads on this show. That’s all I can say. Is anybody really going to miss any of these people? Oh no, not Love Interest #47! (I think they said her name was Jessie, but I might just be thinking of the yodeling cowgirl from Toy Story…) Rick had dramatic flashes of kissing her while she flailed around in slow motion, but it didn’t do the job for me. It shouldn’t have done the job for Rick; their courtship lasted about five hours. Overall, however, I would say the scene worked due to the fact that people WERE dying and there didn’t appear to be an easy way to escape that fate for anyone. It may have only served to cut a lot of dead weight from the cast, but it was effective. 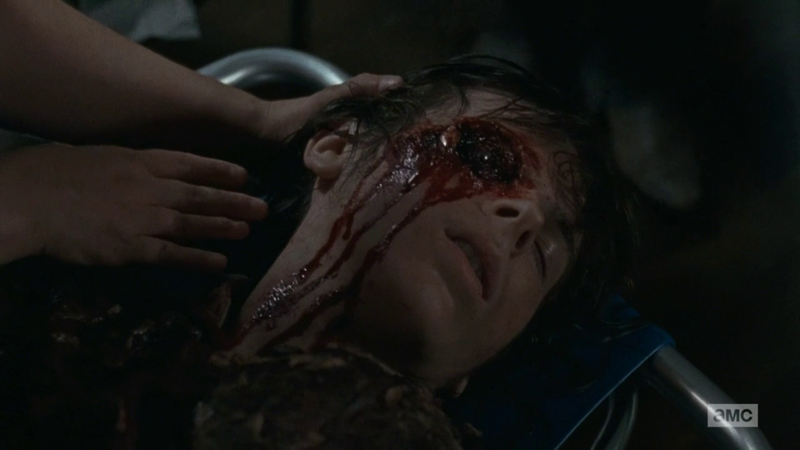 I can mention Carl’s eye injury on the site now that it’s happened on the show. In the comics he’s had an eyepatch for some time. 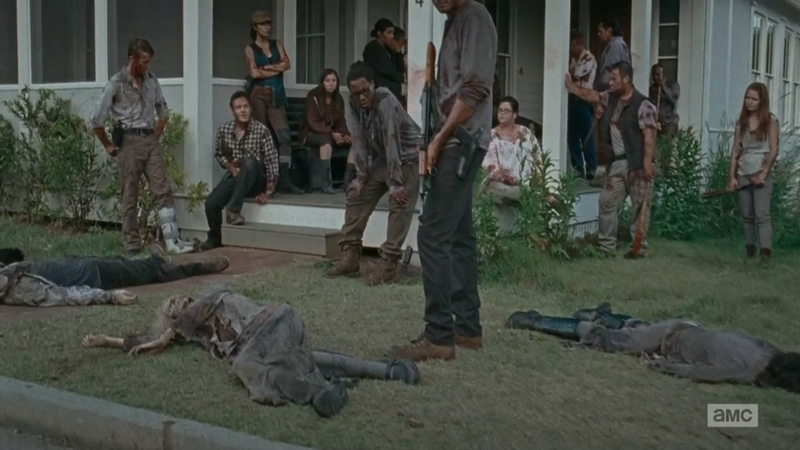 Rick carries an unconscious Carl back to the medical area (and the Walkers are polite enough to ignore him, but Mr. Wolf seems to have served as a distraction). 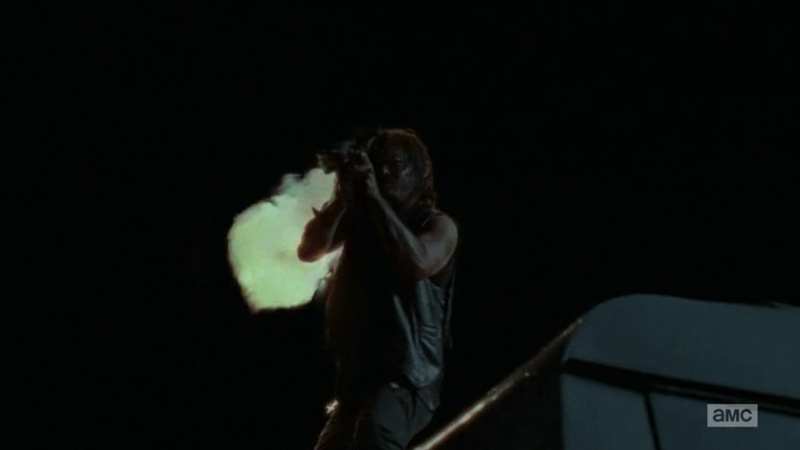 His boy is injured, his girlfriend he JUST GOT that afternoon is dead already….Rick has had ENOUGH. The others notice Rick’s newest bout of insanity and decide to join. 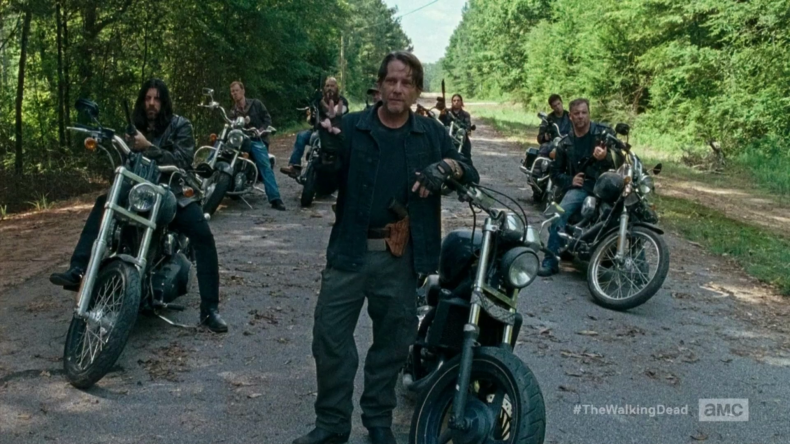 To those who might have thought this victory came about a little TOO easy after everything they’d been through, think about this: Negan is on the horizon and what we really need now is a big, joyous, manly, macho Good Guys Win scene to lift our spirits before things get REALLY dark. And we got it. 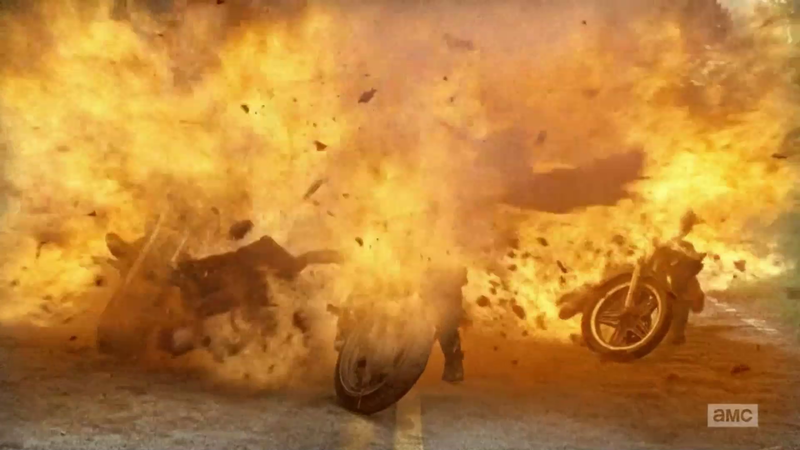 Back in the first episode of this season, they could have done this to the quarry and saved a LOT of pain and suffering. But then again, we would likely still have Sam around if that happened. The next morning, everyone is on the porch, surveying the collateral damage and breathing huge sighs of relief. 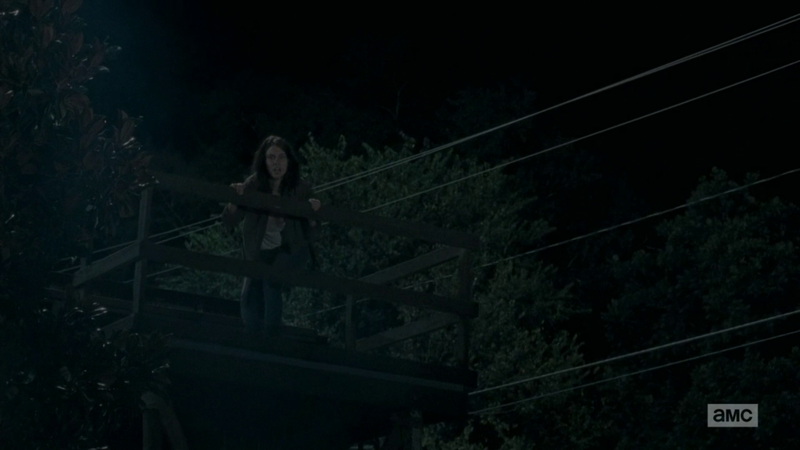 They faced the biggest challenge that zombies can possibly deliver and won the fight. 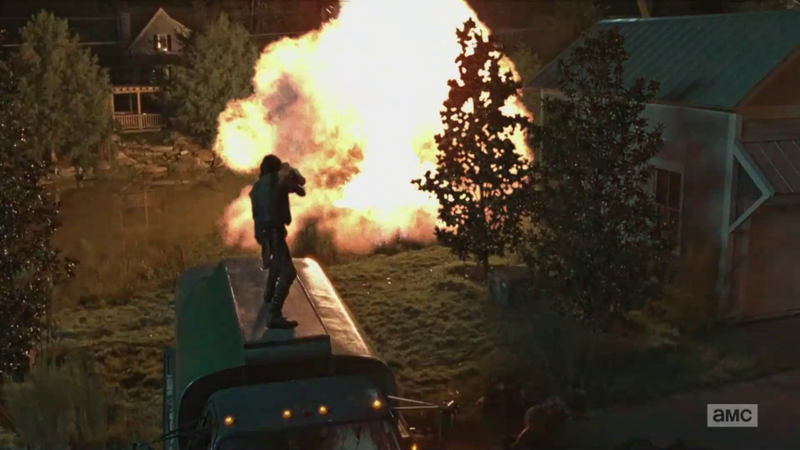 If Alexandria can survive this, what can possibly bring it down?